In Humanscale's typical flair for high design, the new QuickStand Lite is a looker. But the beauty is skin deep. 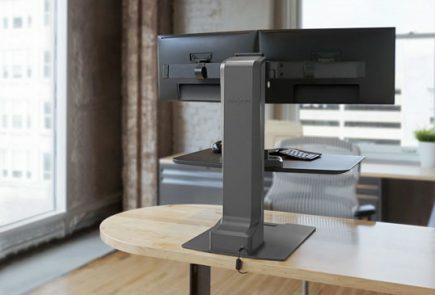 In attempting to offer a lower priced product to compete with the massive number of new sit stand desk converters on the market, while retaining the fancy finishes that Humanscale customers expect, they left out too many of the ergonomic features one would expect at this price point. Still, this is going to be a very popular product, no doubt, because of its sleek, minimalist styling. "Hovering" monitor arm style. Base can be edge clamp or grommet. Standard configuration is single monitor, but a crossbar can be added for dual monitors. Featuring award-winning design (2016 Red Dot Best of the Best) this second entry in the standing desk converter category from Humanscale stays true to their form over function approach. It's sleek and elegant, and would look quite handsome atop any desk. The biggest miss, ironically, is that this leading manufacturer of ergonomic adjustable keyboard trays has once again left keyboard tilt and keyboard drop out of the equation. In essence the QuickStand Lite is little more than a monitor arm with a flat horizontal keyboard work surface welded to it. Humanscale doesn't know how to make ugly products, and they love winning design awards, but we don't see ergonomic awards in the future for this product. While less expensive than the original QuickStand it lacks many features that can be easily found in competing products for the same money or less. That said, Humanscale's stellar reputation for design and manufacturing quality virtually assure its success in the marketplace. The world has long known Humanscale for its high-end monitor arms and adjustable keyboard trays. In 2013 it entered the office fitness market with the chi chi FloatTable adjustable-height desk, one of our favorites in the instant-changing, counterbalance mechanism category. 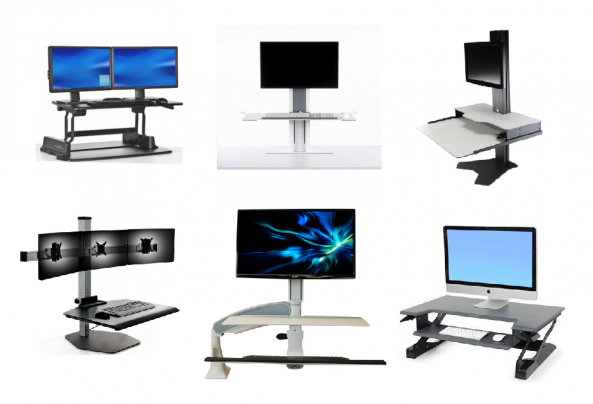 In 2014 it entered into the burgeoning new category of height-adjustable workstations (a.k.a. 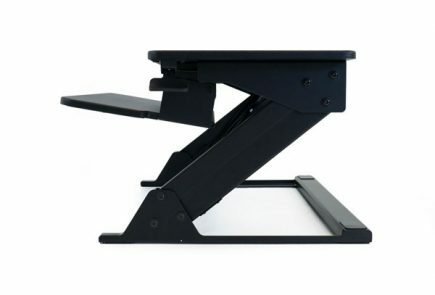 desktop risers, or standing desk converters) with the QuickStand, an ultra-elegant design that was also quite pricey. 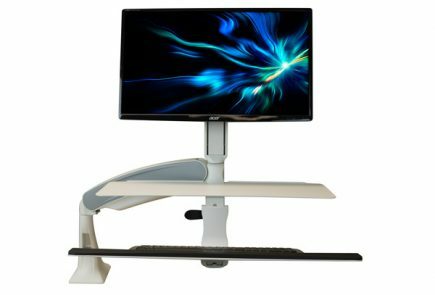 Despite its high price the original QuickStand height-adjustable workstation has enjoyed raging sales success in the corporate market, according to the company, and we don’t find that surprising at all. Where companies like Ergotron have long dominated healthcare settings, Humanscale has long dominated in law offices, Wall Street firms, and other corporate dominions where a lot of money is put into interior design. Not to leave well enough alone, Humanscale wanted to respond to criticisms of the QuickStand’s high pricing with a new, lower-cost version of the original, dubbed the QuickStand Lite. While they can declare Mission Accomplished – the Lite is nominally less expensive – the new design does not improve on the QuickStand’s minimalist ergonomic adjustability. Yes, the new price is lower, but competitors have since introduced many more products in this price range, many with far greater ergonomic adjustability and more impressive features. If aesthetic design is what you mostly care about, and long periods of computer use are not a requirement (e.g. as a workstation to set up in a showroom or lobby for very light use) you won’t find another arm this pretty for this price. But a value leader it is not. The QuickStand Lite falls into a different category of adjustable height workstations than the QuickStand. Where the original QuickStand was a prettier version of Ergotron’s venerable Workfit-S, the new Lite model is a “hovering” design, going after Ergotron’s equally venerable Workfit-A. 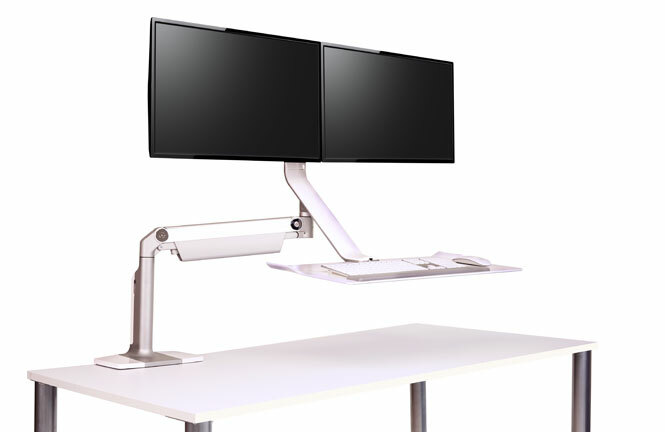 As such it is basically a monitor arm that clamps to the back of the desk, with a fancier mounting plate attached to the top of it that also extends down to present the user with a flat surface to place their keyboard and mouse upon. Other products in the hover category now include the iMovR Cadence Adjustable Height Workstation, Cadence Express, Cadence Plus, and the ESI Climb Adjustable Height Workstation, both of which have a lot more adjustability than either QuickStand model. While the Climb leans more towards the Ergotron industrial/metallic aesthetic, the Cadence has a fresh styling and multiple color options that stands up well side-by-side with the QuickStand products, and gets you a lot more features for the money. We’ve said this before when reviewing adjustable-height workstations… we simply can’t understand why companies that are known for making high quality adjustable keyboards trays have rushed to market with new desk converters that completely lack any keyboard tilt angle adjustment. At least with many of the contenders in this category the keyboard tray is “dropped” below the desk surface by four to seven inches, rather than just laid flat atop the desk. For a height adjustable workstation in this price range we find it more than a bit puzzling. No doubt the QuickStand Lite will still fly off the shelves, just as its predecessor did, creating yet another successful product for this highly successful and rapidly growing, global manufacturer of ergonomic products. That’s how much their brand reputation for manufacturing quality and aesthetic design factors into the equation. When you could by a height-adjustable workstation with greater height adjustment range, an adjustable drop and adjustable tilt on the keyboard platform, a monitor mount that can tilt, pan and rotate, a second work surface platform, a much wider radius, and heavier duty construction all for under $600 we’re a bit challenged in recommending the QuickStand Lite, even at its new reduced price, for all but the very most aesthetically sensitive consumers. Good thing for Humanscale, there are a lot of them out there. *Full disclosure: iMovR and WorkWhileWalking have ownership interest. However, we can assure our readers that we expose the good and the bad of every product, regardless of any financial connection we may have to the manufacturer.